Dragonflies and damselflies are insects in the Order ODONATA. They are some of the more noticeable insects, especially around the bodies of water that they call home. Their amazing aerial capabilities and superb sense of sight make them fascinating creatures to watch. As with birds, learning to tell the different species apart would seem to be an obvious first step into their world. But an easier step is to observe their different behaviors instead! A small pond may have 6 or more different species active at one time. A lot of their activity has to do with breeding. Being insects, this is no surprise, but their high visibility means this is all out in the open where it can be easily seen. Mated pairs of some species fly around in tandem. The male flies in front, holding the female by the nape of her "neck" with special claspers on the end of his abdomen as the female lays her eggs. Males of some other species will guard the airspace around a female they have mated in an attempt to prevent other males from mating with her. The method of egg-laying is quite variable. Some species dab their eggs one at a time into algae mats or in open water. Others drop their eggs from above without touching the water. 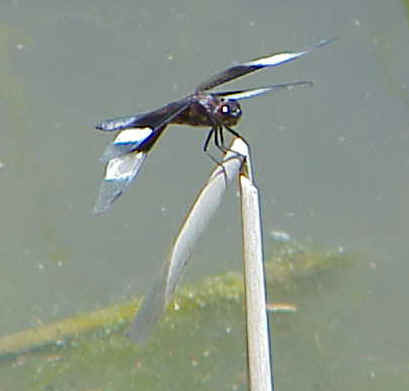 Darners use bladelike structures on the tip of their abdomen to make tiny slits in the stems of aquatic plants and insert their eggs individually into these. Different species have distinct habitat preferences. Some species spend all their time around water. Other species, when not courting, may be found cruising over meadows. Some are only found along wooded streams. And then there is the ongoing pursuit of food in the form of other flying insects, which they catch - and eat - in mid-air! Since they can see so well, getting close enough to these flighty insects to make accurate species identification and see the details of their behavior can be quite a challenge. Many species can be easily identified with the naked eye, but others require more careful inspection. As with butterfly watching, a pair of close-focusing binoculars is a great help in this matter. These keep you outside the dragonflies' comfort zone so you can view their normal behavior rather than behavior driven by fear of your presence. Beginning as a water-breathing, aquatic juvenile stage called a naiad and finishing as a winged air-breathing adult. As either naiads or adults they are strictly predatory feeders. The feeding strategy of the naiads is almost as remarkable as that of the adults. The naiads have a unique, hinged lower jaw with a pincer on the end. They use this to grab their prey, which may - for the larger species of dragonfly naiaids - be as big as small minnows! For defense, they can use jet-propulsion to get away from their enemies by squirting a blast of water out their cloaca! The following is a list of all verified species seen in Kansas. It was compiled by Roy Beckemeyer. Common names follow those used by the Dragonfly Society of the Americas. Red Damsel - Amphiagrion sp.